Our 60 minutes full body hot oil swedish massage is our most popular massage. The masseuse offers 3 levels of pressure (light, medium and firm) to suit the needs of the individual on a wide comfortable heated bed, carried out in a beautiful candlelit room to a collection of world music with the right balance of uplifting sounds to calm and relax you. For individuals that prefer deep tissue massage, we recommend Traditional Thai Oil massage. Performed by two Thai masseurs and is an experience you will never forget. The effect sends the body hurtling into a heightened sense of bliss and is suitable for both individuals and couples. The atmosphere alone is totally engaging and is a hypnotic, mesmerising and ultimately a unique massage experience. Share a couple of relaxing hours with the one you love! Our treatment comprises of a private Hydro-therapy bath and sauna for the couple, including sparkling wine* and chocolate delight. You and your partner will be treated to a 75 minute full body scrub and massage to start your treatment. 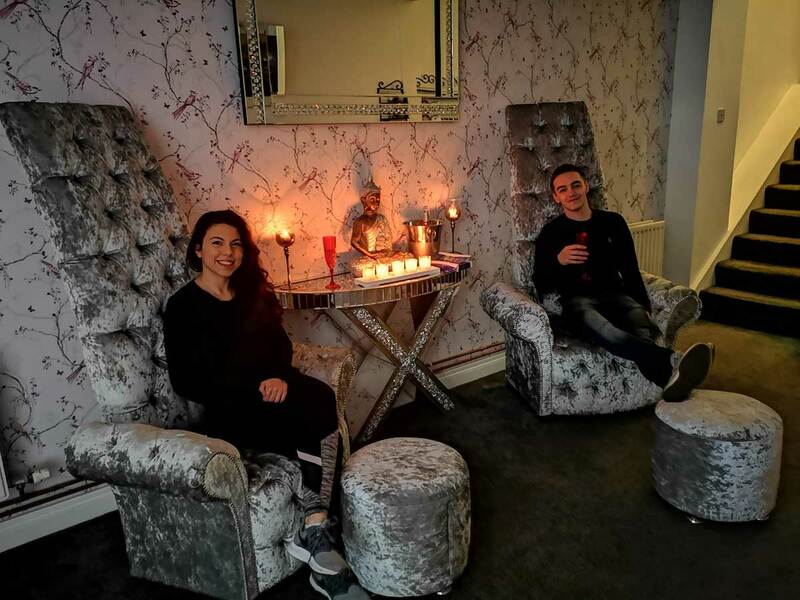 The entire treatment is all done in our Romeo & Juliette suite, beautifully candlelit, with private his & her showers to a choice of your own music. The full body scrub consists of 2 parts, a cleanse and a massage. We first re-energise your skin with a deep scrub, removing dead skin to leave your skin feeling fresh revitalised and glowing. After the body scrub we complete the treatment with a 70 minute full body massage with a choice of either hot oil, cocunut oil or magnesium oil. Our Treat for TWO comprises of a relaxing 50 minutes massage treatment followed by a relaxing dip in our private Hydro-therapy bath (jacuzzi) and sauna along with a complimentary glass of sparkling wine*. Be welcomed into the day spa and greeted with a complimentary glass of Prosecco in our luxurious Royalty high chairs before entering our traditional Thai room. Enjoy a 60 minutes full body hot oil Swedish massage with your partner in our candlelit room whilst listen to relaxing world sounds. Escape from the office over lunchtime into a sea of tranquility for our special lunchtime back and shoulders 20 minute massage. Our list of massages and services includes Swedish oil massage (which is our most popular massage), Aromatherapy, Back and shoulders massage, Coconut oil massage, Body scrub and hot oil massage, Magnesium oil massage, traditional thai massage, traditional thai oil massage, traditional thai foot massage. Thailand is the birth place of traditional Thai massage so why not treat yourself to something uniquely Thai. Try a four hands massage, performed by two Thai masseurs and is an experience you will never forget. The effect sends the body hurtling into a heightened sense of bliss and is suitable for both individuals and couples. The treatment is carried out in a beautiful candlelit room to a collection of world music with the right balance of uplifting sounds. The atmosphere alone is totally engaging and is a hypnotic, mesmerising and ultimately a unique massage experience. Escape from the office over lunchtime into a sea of tranquility for our special lunchtime back and shoulders 20 minute massage. The massage is suitably long to rid yourself of a morning of business knots preparing you to attack the rest of your day and short enough that you still have time to get a full lunch without missing out.